We need to figure out how much strike water to transfer to the Mash/Lauter Tun in order to soak (mash) our grain. Like mash temperature, the water to grain ratio (often called 'liquor to grist ratio') used when mashing also affects the beer you produce (to a much lesser degree however). Generally speaking, a thicker mash (less water) produces a beer that is fuller/sweeter as it creates more unfermentable sugars while a thinner mash (more water) produces a thinner/dryer beer as it creates more fermentable sugars. This mash thickness is usually expressed as the number of quarts of water per pound of grain. A mash thickness of about 1.25 quarts/pound is a common ratio used for most ales. For beers such as this one that we want to be a bit thinner/dryer, 1.5 to 2.0 quarts/pound is common. Our 20 gallon Blichmann kettle holds 0.22 gallons under the false bottom and there is approximately 0.5 gallons of liquid in our hoses and the 50 foot HERMS coil, so we account for these in our equation. Turn the ELEMENT SELECT switch OFF. Turn the WATER PUMP switch OFF. CLOSE all valves. 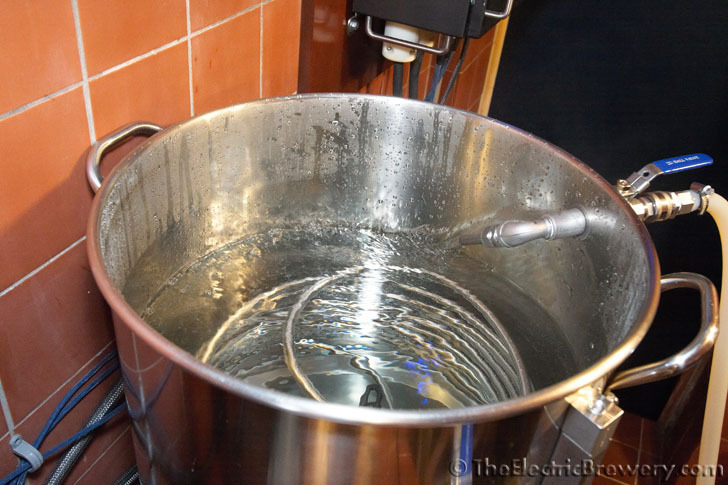 Move the hose from the Hot Liquor Tank IN valve to the Mash/Lauter Tun IN valve as shown in the picture below. 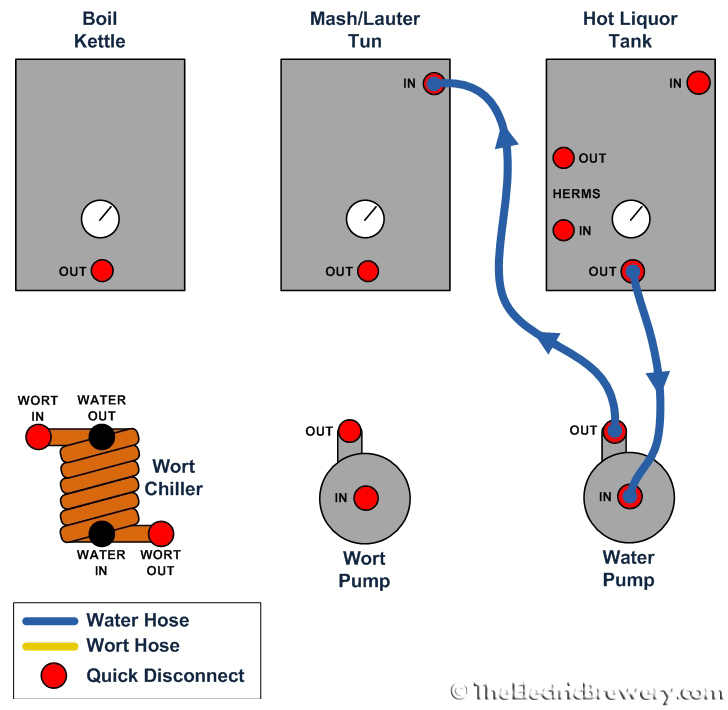 OPEN the Mash/Lauter Tun IN valve first, then the Water Pump valve, and finally the Hot Liquor Tank OUT valve (this order helps ensure the pump head is fully primed). Turn the WATER PUMP switch ON. Transfer ~7.5 gallons to the Mash/Lauter Tun. CLOSE the Water Pump valve. Turn the WATER PUMP switch OFF. Keep the Mash/Lauter Tun and Hot Liquor tank lids on throughout the process to minimize heat loss. If brewing indoors you may want to run your hood fan at low speed to exhaust any excess heat.